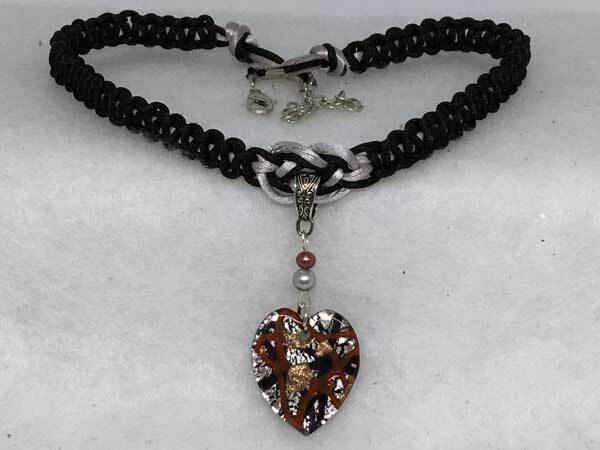 This piece is made with satinique cord in combination with nylon cord in silver and black. The length can vary from about 17 to 20 inches with a center jeweled piece that adds 2.5 inches. The first section of the jeweled piece consists of a medium brown and larger silver pearl round. Hanging separately from this, for added movement and sparkle, is a lovely glass foil, elongated heart in silver, black and brown with bits of champagne-colored sparkle.